This is my IVF diary. My husband and I have been trying to have a baby for four years now, and have a diagnosis of 'unexplained infertility'. We have finally reached the top of the waiting list for IVF – a form of assisted conception. I'm blogging about what happens as it happens, as a kind of therapy for me and as an awareness raising exercise of what IVF is all about. As you know I am pregnant, and my due date is 4th July. As such I thought I would be free to complete this project during April and May. However, I have had some complications with my blood pressure and I currently need to attend monitoring appointments at the hospital taking up two full days each week – plus other routine appointments. If things continue like this I believe this leaves me time to complete your project as planned and it would be my preference to continue working, however what I don’t know is how the blood pressure situation might escalate. I have been told I might need to spend more days in hospital, or be admitted overnight, or be induced early. Any of these would be a risk to the project completion and it is unlikely I (and therefore you) would get much notice. I wanted to draw these risks to your attention before we commence, and give you the opportunity to decide whether you feel able to proceed in these circumstances or whether you prefer to make alternative arrangements, perhaps with someone else. I’m sorry for this inconvenience. I’m already only able to work half time, and I’ve also got five clients who are dragging their feet on finalising reports I’ve written in the last quarter, which is a bit of a stress. I want them out the door! I’ve tried the usual cajoling but these things can take time if a client is busy and not prioritising the final stages (even though they all gave me deadlines for getting the work in!) I feel I have so much hanging over me at the moment and I want to be sure it all gets finished before I’m forced off work with one of my various pregnancy illnesses. 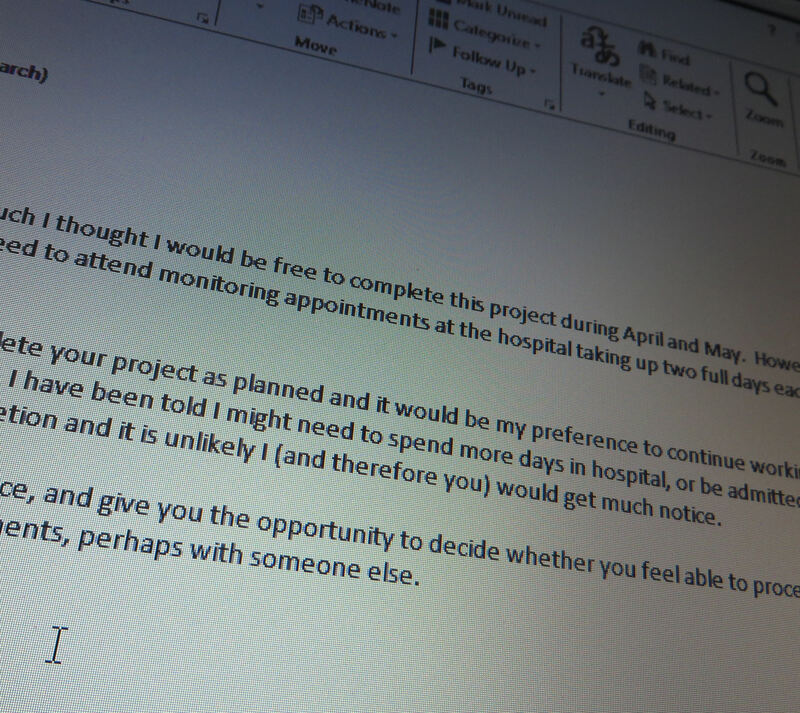 In the last few days I’ve bitten the bullet and sent the above email, plus similar ones to the existing clients to try and get things wrapped up in April. In some cases is this is the first time I’ve mentioned I was pregnant to the individuals in question. It has not been relevant before. Sending these emails is a cost to me. That’s how my counsellor puts it. Sending the emails goes against my normal behaviour and makes me feel uncomfortable. It makes me feel uncomfortable to think I might not finish work I’ve started (I don’t recall any work ever going out late in the twelve years I’ve been working) and it makes me feel uncomfortable to mix up my work life and personal life by mentioning anything about my personal life to my clients. To me this goes against my professional ethics. However to me it is even more unprofessional to hide risks from my clients. So we are where we are. I’m sure they will be fine. But I don’t like it.